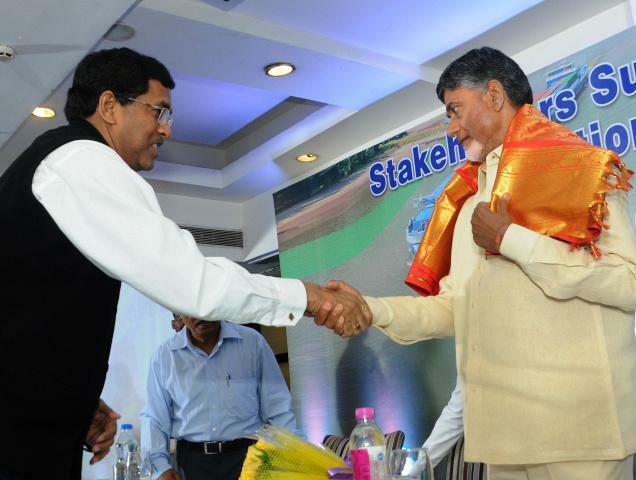 Chief Minister N. Chandrababu Naidu has suggested to the Inland Waterways Authority of India (IWAI) to take steps for increasing the quantity of goods transported through inland waterways in the State by 5 per cent in the coming years. The Krishna river and its canal network and the Godavari river system had tremendous potential for goods transportation. Development of National Waterway-4 was on top of the government’s agenda, he said. Addressing NW-4 stakeholders’ meeting here on Thursday, Mr. Chandrababu Naidu said only 0.3 per cent of the goods transportation took place through inland waterways in India compared to 8.7 per cent in China and a whopping 42 per cent in Norway. “We have the scope but do not have a proper mechanism in place. The NW-4 could be transformed into a model for other waterways provided the NHAI and other stakeholders collaborated with each other closely while the Central and the state governments provided the requisite funds”, he said. The riverfront along the upcoming capital city Amaravati could be utilised for transportation and also developed into a tourist attraction, he said. IWAI Chairman Amitabh Varma said the 880 km-long waterway connecting Buckingham Canal to Vazirabad in Nalgonda district through Kakinada, Eluru, and Vijayawada was under development. Thirty million tons of cargo could be transported through it by the year 2021. Irrigation Minister Devineni Umamaheswara Rao and Energy Secretary Ajay Jain were among those present.